Enlarged version of a mocking "warning card" to be placed in railroad trains, buses, streetcars, and other public forums. Warning reads, "Beware! Young and Old--People in All Walks of Life! This [Marijuana Cigarette] may be handed you by the friendly stranger. 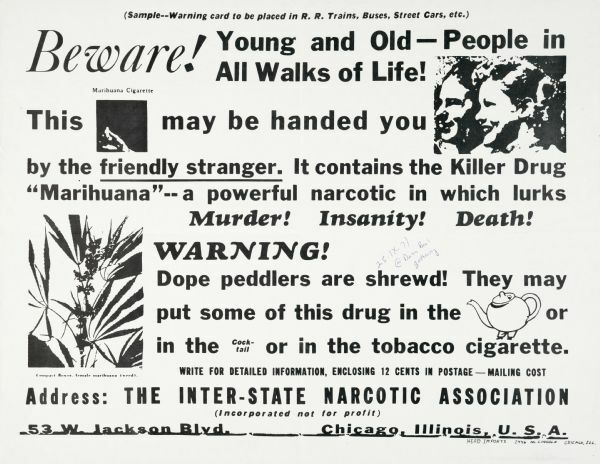 It contains the Killer Drug "Marihuana"--a powerful narcotic in which lurks Murder! Insanity! Death! WARNING! Dope peddlers are shrewd! They may put some of this drug in the [teapot] or in the [cocktail] or in the tobacco cigarette." "25-IX-71" appearing on the front refers to its date of acquisition by J. Wesley Miller: September 25, 1971. Notation "at Dana Beal gathering," further suggests that the content of this poster is not in earnest.